By: Dr. Phil Wagner, M.D. Once you rule out surgery and a concussion, there is only one question to answer. Is it acute or is it chronic? In medicine, acute is defined as a rapid onset or short course. Other cues can help this diagnosis, such as a sudden sensation of a pop or snap, almost like you got shot before falling to the ground or letting go of a ball. Underlying most acute injuries is a chronic condition, a situation that interferes with normal life, in this case being a healthy athlete. The real catch is that acute injuries inevitably become a chronic condition, its just a matter of when. Soft tissue includes anything that connects, supports, or surrounds the structures of the body. But we will focus on the more commonly injured structures like tendons, ligaments, or muscles. Like most things in life, the phases of soft tissue injury and repair follows the rule of threes (see: How to eliminate training distractions on Sparta Point). Dr. Robert Schleip a soft tissue expert of the Division of Neurophysiology in Ulm University, Germany, goes through an in-depth description of the phases. Phase 1 is the inflammatory phase, which begins immediately after the injury, and involves bleeding into the tissue (See: Treating ankle sprains: Why RICE never works via Sparta Point). After 48 hours, this phase becomes dominated by fibroblasts from day 2 to 5. Phase 2 is the Proliferation Phase and lasts anywhere from 3-6 weeks, and mostly involves the fibroblasts creating collagen, popularly known as scar tissue. 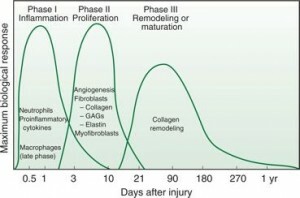 The remodeling aspect of Phase 3 can last up to a year as the scar tissue (collagen) transitions from an unstable form (type III) to a more stable type (I). Because of the shift from inflammation, a reactive response, to proliferation and remodeling, we consider Phase 2 and 3 to be the start of a chronic condition. However, not all chronic conditions are the transition from an acute injury. Chronic conditions can also exist for months, years even, without any defining incident. These conditions often resemble a dull ache or waxing/waning discomfort. Examples include, but are not limited to patellar tendinopathy, impingement of the hip or shoulder, or shin splints. Generally they are overuse injuries or repetitive strain injuries which lead to excessive microtrauma of the soft tissue. So we know the most important question; how to differentiate acute versus chronic. An acute injury is a discrete occurrence that occurred less than a week ago, otherwise it is a chronic condition. This label then allows us to focus our injury blocks for the prescription of strength, skills, and regeneration. Acute injuries require time for the inflammation phase to finish, so you must avoid loading the area, particularly any lengthening contractions (eccentric) that could stretch and disrupt this Phase I of the healing process. So we prescribe movements that have more concentric emphasis. Bilateral movements like squat, deadlift, and leg curl are the favorite movements because the more stable base allows a lesser eccentric challenge than standing on one leg. Joint integrity is critical for the execution of these fine motor movements. This joint integrity continuum contains mobility or stability on opposing ends. As mentioned in strength above, mobility is not the goal for an acute injury, stability is the crucial aspect in restoration. So we choose one of the movements from our stability series (see: The SPARTA Stability Complex on Sparta Point). According to an April 2013 study, fascia is the skeleton of muscle fibers organized as a network that connects the musculoskeletal system. This web can be responsible for the pathophysiology and healing process of all muscular injuries. So addressing trigger points is critical for treating and training this fascia to heal correctly. Acute injuries should be addressing overactive muscles, while chronic conditions generally involve under-activemusculature. Schleip, Robert Edited by Findley, Thomas W. Edited by Chaitow, Leon Edited by Huijing, Peter. Fascia: The Tensional Network of the Human Body, The science and clinical applications in manual and movement therapy. Martínez Rodríguez R, Galán Del Río F. Mechanistic basis of manual therapy in myofascial injuries. Sonoelastographic evolution control. J Bodyw Mov Ther. 2013 Apr;17(2):221-34.